Something tells me Mark Zuckerberg and other Facebook employees might "like" this story. Facebook's stock rose 3% Tuesday and hit at an all-time high. And the company is now worth more than Walmart. Facebook's (FB) market value is nearly $245 billion -- an amazing feat for a company that has only been around since 2004 and started trading on Wall Street in 2012. The stock is up more than 11% this year. The recent rally has been fueled by optimism about the company's plans to launch interactive mobile video ads. 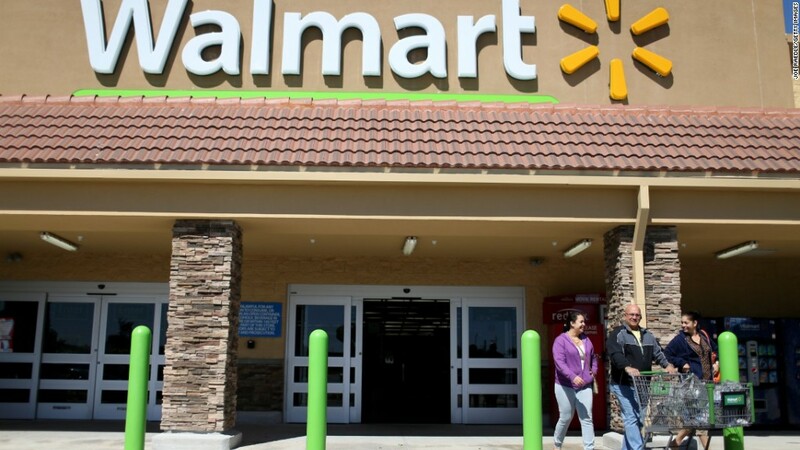 Walmart (WMT) is now worth about $235 billion. Its stock has fallen 15% so far in 2015 due to concerns about weak sales and increased competition from the likes of Amazon (AMZN) and Target (TGT). Walmart doesn't really compete with Facebook, of course. But Walmart CEO Doug McMillon told CNNMoney's Cristina Alesci on Tuesday that Facebook and its subsidiary Instagram are two of the companies he most admires. Walmart is still the world's largest when it comes to total sales. But as a result of Facebook moving ahead of it, Walmart is no longer among the top ten most valuable companies in the S&P 500 index. So who's next for Facebook to pass? JPMorgan Chase (JPM) has a market value of nearly $260 billion. But it may take some time for Facebook to pass it since bank stocks have been on fire lately thanks to expectations of an interest rate hike later this year. Still, Gene Munster, a prominent analyst at Piper Jaffray, just raised his price target for Facebook to $120 a share -- nearly 40% higher than its current price. At $120 a share, Facebook would be worth about $337 billion. That would make Facebook more valuable than JPMorgan Chase as well as General Electric (GE), Johnson & Johnson (JNJ) and Wells Fargo (WFC). The only other companies with a higher market value? Warren Buffett's Berkshire Hathaway (BRKB), Exxon Mobil (XOM), Microsoft (MSFT), Google (GOOGL) and Apple (AAPL).